THREE LESSONS On John Marshall’s 263rd Birthday For Living a Better Life . . . 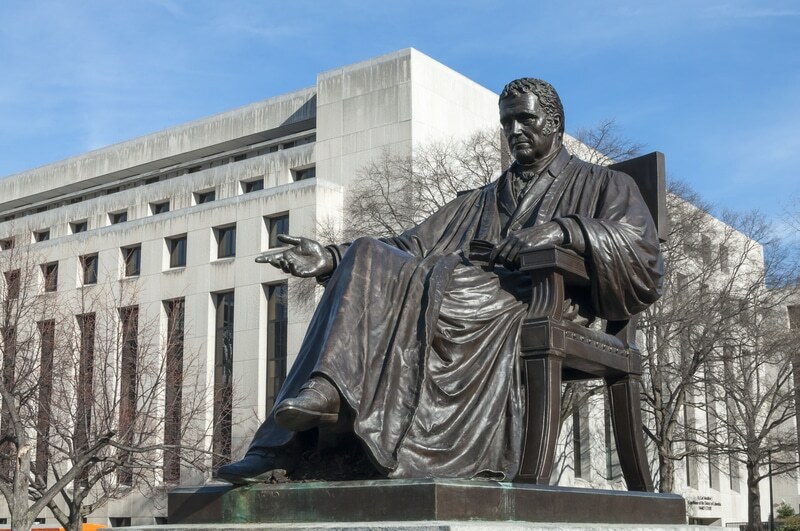 Happy 263rd Birthday Chief Justice John Marshall! On this day little fanfare and even less discussion will center on this national milestone. This is unfortunate, perhaps even a little bit tragic. For when Marshall passed away in 1835 the Liberty Bell was tolled for the last time—in commemorating the sad news the bell was forever cracked, silencing it for posterity. John Marshall is more than simply the fourth Chief Justice in American history, more than John Adams’s Secretary of State, more than a central figure in the famed XYZ Affair, more than the first biographer of George Washington. John Marshall, I would argue, is the most consequential and significant American to ever live who never held the presidency. Yes, arguments could certainly be made for Alexander Hamilton, Benjamin Franklin, and Martin Luther King. But Marshall embodied the American spirit before there was an America. He understood that the experiment of constitutional self-government could not remain in a fragile, embryonic, invertebrate state in perpetuity, that constitutional questions demanded answers as newly created institutions of governance must know their proper orbits in the constructed constitutional universe that was the United States Constitution. But for young Americans, there are monumental, even profound lessons, to be learned, not from Marshall the judge, the diplomat, or the Secretary of State, but from John Marshall the man. A laudatory and accessible humanity undergirds the life of this American titan. Many tomes have been written extolling the voluminous public contributions of John Marshall. But beyond the headlines in history books, Marshall’s life is instructive on a more personal and human level. With this observation in mind, I offer three life lessons from the life of John Marshall. John Marshall loved and revered George Washington. He was an active soldier in Washington’s Continental Army. Indeed, his youthful experiences fighting in the Revolutionary War was the fulcrum that tipped his life in a decidedly nationalistic direction. He was present at the famous winter of Valley Forge, suffering with Washington, and saw for himself what titanic endurance, durable character, and sublime fortitude looks like in human form. When Washington died in 1799, the message from Mount Vernon was sent directly to Marshall. It was Marshall who delivered the first president’s eulogy. He headed a commission charged with creating a national monument in his honor. Of all the framers, no one was personally closer to George Washington in his waning years. The first authoritative biography written about the Father of the Country was not written by a professional historian or a close family member. Instead, it was written by a sitting Chief Justice of the United States Supreme Court. While performing his duties on the court, as well as riding the circuit courts of Virginia and North Carolina, in just five years Marshall penned a five-volume biography of George Washington—indeed, the Life of Washington spanned 3,200 pages in total. There are countless editions of the work through the centuries and has been updated as recently as 1983. By embracing Washington as his hero, Marshall demonstrated what has been forgotten by so many modern citizens: the success of any republic is proportional to the virtues of its citizens. Thus, republics flourish when citizens have models to live by, heroes to emulate, and characters to instruct. The founders knew Plutarch by heart. Washington himself never passed an opportunity to watch Addison’s dramatization of the Roman Senator Cato. Washington was the personification of the Greek axiom (probably offered by Heraclitus) that character is destiny. It is true of individuals. It is true of entire nations. Having a model, a hero, or an exemplar, is one of the keys to living a good life. For how can any man or woman master his/her inner struggles and outer hurdles without knowing what such glory looks like in real time and space? Modern students would do well to remember that if you are truly successful and substantive, truly impressive and widely impactful, then the last person in the world who needs to point it out is you. In a world that often turns its attention towards volume and outrageousness instead of virtue and excellence in action, it should come to no surprise that young people are often tempted to succumb to the habit of ostentatiousness, of positioning one’s beak higher than the herd’s, of braggadocio or mindless swagger. And yet, Marshall is a model of unassuming excellence, of achievement without accompanying acclaim. By all accounts, his “convivial temperament” projected the aura of a man who was perennially comfortable in his own skin. He treated everyone the same wherever he was and seemed to delight in dressing in the garb of the ordinary man. Amusingly, he once looked so disheveled that his neighbor took him for a transient and threw spare change at him. He never let strangers know who he was. More to the point, his manner was such that they would never assume they had just met a towering figure of American history. He made friends with virtually everyone, a political foe, and friend alike. He was friendly with both Madison and Monroe, highly respected by Patrick Henry, and personally closer to George Washington than anyone else. The genuine and zealous exception to this rule was his deep, almost maniac disdain for his second cousin, the man he called “the great lama of the mountain,” Thomas Jefferson. As Henry Adams once observed of Marshall’s disquietude towards Jefferson, “ . . . this great man nourished one weakness. Pure in life; broad in mind, and the despair of bench and bar for the unswerving uncertainty of his legal method; almost idolized by those who stood nearest him . . . this excellent and amiable man clung to one rooted prejudice: he detested Thomas Jefferson.” Marshall, it turns out, was human after all. From a constitutional perspective, Marshall is the man primarily responsible for creating a uniquely American character and ethos. As a young man fighting for liberation from the British, Marshall quickly became suspicious of the provincialism of state power and policy, often disappointed when states failed to supply the necessary goods and weaponry to successfully win the war. Even before there was a concept of “We The People,” Marshall attached his allegiance to a broader conception of nationhood. In contrast, when Jefferson spoke of “my country” he was referring to Virginia, not the inchoate concept of “America.” Thus, years later as Chief Justice, Marshall forged a constitutional consensus over three decades on the court in cases such as McCulloch v. Maryland, Gibbons v. Ogden, and Dartmouth College v. Woodward, that conceived of the Constitution as representing the interests of “the American people,” not that of individual states. His rulings, constitutionally speaking, united the United States of America, striking a blow to those who conceived of the Constitution as a mere puffed up version of the Articles of Confederation or viewing our ruling document as a compact among states instead of the supreme law of the land. Marshall knew how to build consensus and find common ground. The justices in those days boarded together and did so until 1830 and would often engage in post-dinner Madeira (a Portuguese wine that was also poured for Jefferson’s toast when signing the Declaration of Independence) where conversations and discourse centered on resolving the disputes brought before the court. Nowadays, justices convene for a Friday afternoon conference to deliberate on their decisions. In Marshall’s day, the conditions were decidedly more conducive to decision-making through leisurely fraternization. There is a mistaken notion in our culture that professional success often comes at the cost of personal virtue, that fulfilling one’s fate is often a torturous choice between grand ambition and quiet decency. Marshall’s life is evidence for young people that Herculean achievement is not germinated from an enlargement of the self or a vindication of an angsty ego. The price of getting what we want is not always paid for in the currency of compromised character. If our students understood this their lives would be better, our discourse would be purer, and our politics more just. To this end, let us celebrate the life and birth of John Marshall.